- The Imperium has razed many of the large mountains on Cyrene with an orbital laser to harvest massive amounts of minerals for an unknown project. - This has significantly changed the landscape of Cyrene and released a new creature from the depths, the Vlanwing, a bat like creature andone of thefirst mammals on Cyrene. - The robots that the Imperium sent out, Protocores, to harvest the new craters have become unstable due to an electrical discharge remaining from the orbital strikes, and have turned hostile. 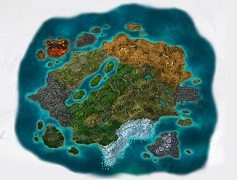 - The Turrelions have stepped in and offered to solve this problem for the Imperium and have set up bases and teleporters near all the major craters (which need to be discovered). - Agis, a master hunter who has hunted and documented his hunts of Cyrene creatures. - non, who goes above and beyond to help many new players and offer suggestions. - Remy, who has discovered many blueprints on Cyrene and has helped with feedback to improve Cyrene. - Thanatos, has found, pointed out, offered suggestions on how to fix many bugs that were not made public. 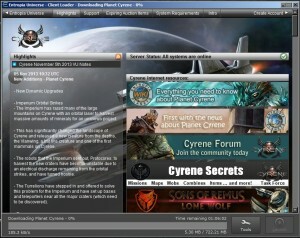 - TunerS, who has compiled and shared all the data he has gathered about Cyrene from combines to creature loot. Each of these players has helped not only in shaping Cyrene, but helped other players who have come to call it home. - Vlanwing, a fearsome creature from the depths of Cyrene. - Protocore, renegade mining robots that have turned on their masters. - Acidic Jellyworms, mutated by toxic environments. - I.S.O.R. (Imperium Orbital Strike Reconnaissance), a mix of Zekkonian and Imperium technology. - A.R.C. Hazard, a combination of A.R.C. and Zekkonian design. - Improved B.E. Armor, a combine of B.E. Armor and other materials into a new and improved armor set. - New Plastic Components using many basic ingredients. - New First Aid Packs designed by the Ozpyn Corporation. - The Imperium Refiner is finally available from the Trade Terminal. - New Detectonators along with New Mining Amps. - New First Aid Packs (aside from those crafted ones) for levels 30+. - In addition to the BLP Pistol from the Stage Two Epic Chain ( Ozpyn BLP S1X4) there is now a Laser Rifle (Ozpyn Replical HK S1X4). - New Clothing rewards from the Proving Ground and Arenas that can be worn outside of the Hub. The Turrelion Tailor at Base Camp Gamma has more missions for players who have finished "The Ultimate 'n00b' Challenge"
- Stage 11: Stage 11: The Senator Speaks! - Many new clothing items (shirts, pants, boots, jackets, coats) have arrived and are available to buy from vendors with your Reward Tokens (White, Green, Blue, Purple, Orange, Red, Lime Green). - The Proving Grounds items to engage in PvP have changed: now to enter it takes 5 Vibrant Sweat, and per kill you awarded 4 Reward Token (Lime Green) used for special clothing that can be worn either inside or outside of the Hub. - All creature hit boxes should work correctly. - Craft an Ozpyn Filter! - Craft an Enkidd Dire S1 (L)! - Craft a Pattern Shirt Series 1 (L,C)! - Craft an Ozpyn Cold Protector (L)! - Craft an Imperium Key Cube! - Mine Up Zorn Star Ore! - Mine Up Yellow Crystals! - Mine Up Kaisenite Stone! - Mine Up Blue Crystal! - Mine Up Iridium Ore! - Hail Lazidol, The Great Sea Beast! - Many grammatical and typographical errors have been fixed. - Several world holes have been filled in. - Tamangon Volcano PvP areas have been fixed to not be larger than they appear. - Global threshold as been adjusted and no more "silent" globals should happen. (however you still must go from n00b base to Puny Beach). - Shopping booths have been normalized in their placement. - Teleport areas have been added to A.R.C. Head Quarters thanks to a donation by Senator Calvin Neff. - Removed many of the dynamic lights to improve overall playability. - Fixed an issue causing any text with a "%" to only display "???". - The I.R.V.M. Instance has been closed while bugs are being worked out. - The disappearing quest objectives should now be fixed. - The no loot and no loot message bug should now be fixed. - The overall speed boost in the Proving Grounds and the Hub has been reduced from 55% to 35%. - The Proving Ground now no longer spawns Entry Tokens, but now instead spawns Reward Token (Lime Green) which have a much smaller PED value and are used to buy special Proving Grounds clothing. - The entry fee of 10 sweat to go to the Proving Grounds as been removed. - The Proving Grounds now cost 5 sweat to enter (down from 10) and now reward you 4 Reward Token (Lime Green) per player kill. - The Trade Terminal PvP weapons have been altered to not only "feel" different from each other, but not enough to make the token weapons not feel underpowered. - There are many sets of clothing available to wear inside or outside of the Hub that can be purchased for different types of Reward Tokens. - The Proving Grounds will now heal players when they enter. - The number of spawn points in the Proving Ground has been increased. - Support weapons are not currently working properly, this is a platform issue. - The Spear MK. III is difficult to maneuver, this issue will be fixed A.S.A.P. - The Spear destroyed model becomes invisible, this issue is being looked into. - In the HUB there is an issue where the stat over ride does not work correctly, this is currently being verified. - All Cyrene vehicles (P.I.G.V., Spear, Lancer, Dragonfly) have default sounds, this will be addressed in a future patch. - Some Quality Ratings information in blueprint book: A.R.C. is incorrect, and this issue is still being looked into. Lastly, as always, please give adequate time for all the new loot to be added and new missions to be activated. Woo Thanatos. You’re a Cyrene celebrity now.